December can be an emotional time for all sorts of reasons. Everywhere we turn we’re surrounded by Christmas paraphernalia meant to brighten our lives and induce us to indulge. Little wonder some of us have silly season fatigue already. And yet that’s not what it’s meant to be about is it? We’re supposed to be joyful, light hearted and upbeat in the lead up to the big day, and then on that day, be rays of sunshine, love and light to one and all. Don’t get me wrong, I love Christmas – it’s just the mayhem that comes with it that I don’t enjoy. Overthinking stuff like parties, clothes, presents, food and avoiding potential disasters creates unnecessary stress and tension. So how about we shake things up this year? Imagine declaring war on stress and anxiety and setting an intention for the opposite. The frantic energy of Christmas can again become a time of fun, love and joy if we intend it to be. And while we can’t control events around us, we can control how we participate in them. My mum says that the best present we can give is our presence. So why not give yourself permission to do it different this year and make your presence be the best present to yourself and your loved ones? Just do it and get ready for a fun filled festive season. 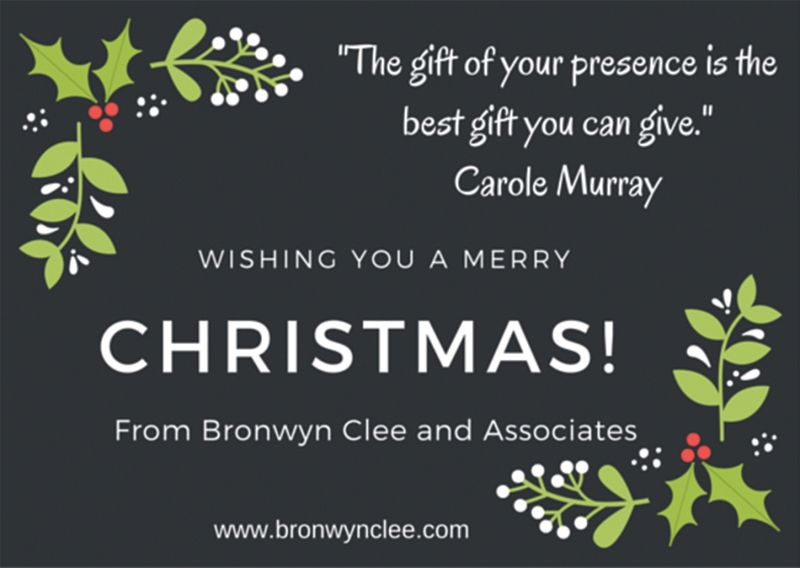 Bronwyn Clee is a heart centred leadership consultant and emotional fitness coach dedicated to facilitating conversations that matter.A world class facilitator and an expert motivator she cares deeply about helping people be the very best version of themselves possible.